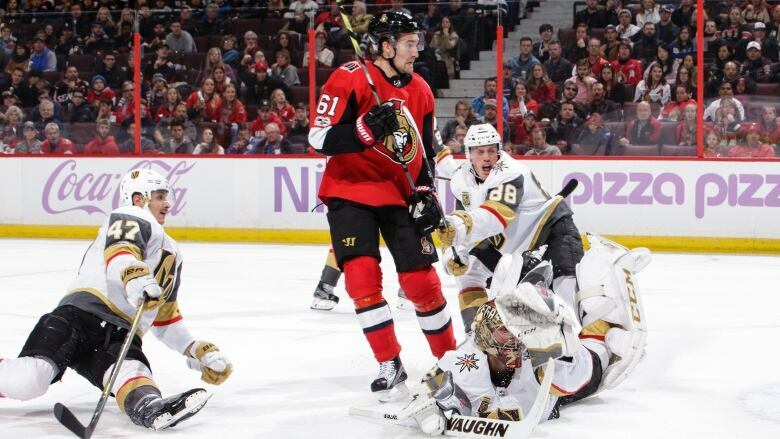 The Vegas Golden Knights, who upended Winnipeg in the conference final in five games last May, appeared to improve the most on paper after they landed right wing Mark Stone from the Ottawa Senators. The Winnipeg Jets were the busiest team, but on trade deadline day they were beaten by the same organization the Jets lost to in the West final nine months ago. The most significant move on Monday wasn't consummated until 17 minutes before the 3 p.m. ET trade deadline because the Golden Knights and Stone's representatives needed time to agree on an eight-year contract extension worth $9.5-million US a season (and yes, there is no state income tax in Nevada). Stone was sought after by the Golden Knights, Jets and Nashville Predators in what could be considered a Western Conference arms race. The Golden Knights stole Stone right from under the Jets' nose. He hails from Winnipeg and played four years of junior with the Brandon Wheat Kings, just two-and-a-half-hours west on the Trans-Canada Highway. But sometimes these types of moves are made because of relationships. And it just happens that the Golden Knights' assistant general manager, Kelly McCrimmon, was Stone's GM/coach with the Brandon. McCrimmon has been an important person to most juniors who played for the Wheat Kings, and his influence on Stone was no different. The sad-sack Senators — and we write this because they were in such disarray this season that they gave up their top four players in the past six months in Erik Karlsson, Matt Duchene, Ryan Dzingel and Stone — received a good return. In exchange for the 26-year-old Stone, the Senators acquired defenceman Erik Brannstrom, forward Oscar Lindberg and a 2020 second-round selection. But the trade deadline day is always about which clubs improved the most with the Stanley Cup playoffs only six weeks away. Determining the winners and losers hours after the trade deadline is a difficult exercise because there are so many factors — health, how the chemistry will be after moves have been made and whether or not your goaltending gets hot at the right time. Just look at the Golden Knights. They made it all the way to the Stanley Cup final last June. They looked to improve their lineup with the additions of Max Pacioretty and Paul Stastny. But Vegas was slow out of the gate with a 14-13-1 start, then after a 15-4-3 run struggled with a 3-9-1 slump in its past 13 outings. The Golden Knights were at their speedy best a year ago. Maybe they have slowed down. Maybe Stone's skill on the ice and personality in the dressing room can make a difference. This is why you roll the dice on trade deadline day. The Jets added a second-line centre in Kevin Hayes, depth players in Matt Hendricks from the Minnesota Wild, forward Par Lindholm from the Toronto Maple Leafs as well as depth defenceman Nathan Beaulieu from the Buffalo Sabres. Hayes was landed in exchange for Brendan Lemieux, a 2019 first-round pick and 2022 conditional fourth-round pick. He may not be the name — or even as talented — as Stastny, the player Jets GM Kevin Cheveldayoff added a year ago. But Hayes does make Winnipeg better. Meanwhile, the team the Jets knocked off in the second round last spring, the Predators, added talented forwards Wayne Simmonds from the Philadelphia Flyers and right wing Mikael Granlund from the Minnesota Wild. Nashville needed to upgrade its power play and these two moves may turn the tide for the 2017 Stanley Cup finalists. The Toronto Maple Leafs added Nic Petan in a minor trade for Lindholm with Winnipeg. The Maple Leafs needed to add grit up front, but they didn't and we'll see whether this was a mistake in the playoffs, especially if they meet up with the Boston Bruins in the first round. If the league-leading Tampa Bay Lightning are the runaway favourites in the East, the West became more interesting because it has five elite-level teams in Vegas, Nashville, Winnipeg, the San Jose Sharks and the conference-leading Calgary Flames. The Sharks also improved their roster in the wee hours of Monday morning with the acquisition of veteran forward Gustav Nyqvist from the Detroit Red Wings. Now we get back to action. Let's see who performs well in the next few weeks and more importantly in the playoffs. Let's see if Vegas did indeed improve the most with its addition of Stone.